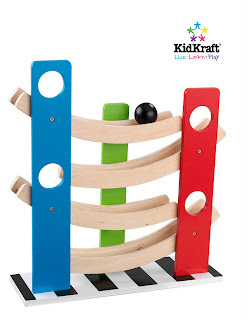 Our Zig Zag Ball Run by Kidkraft is a fun, lightweight toy that would make a great gift for any occasion. Young kids will love watching the ball take its fun ride from the very top all the way to the bottom. Dimensions: 15.75" x 5" x 17.51"
The Kidkraft Zig Zag Ball Run is Recommended for ages 18 months and up. All paints and finishes used on Kidkraft wooden toys and furniture are lead-free and non-toxic.